This was a great launch and a fun day! Found a bug in android version where "heading" reverses direction mid-flight. The bug was created from overthinking in android API code and compensating for "orientation." Orientation should have be locked at launch. I was able to correct the bug by using a formula in excel on the raw gyroscopic data returned. This has been corrected in "live" code and the csv file adjusted for this flight. You can view more info on how I corrected it by reading the comments below. I have added all the images, in order from my video to the image set. This was a test using an older phone - the Nexus 4. It has a built in barometer, can measure up to 4Gs per axis (which I maxed on one axis for the first 4 seconds). I have my phone tilted, the second axis did not max and went up to ~3.3s during this period. I could easily estimate max Gs by doing some excel calculations. I wanted to test the Nexus 4 as they are available on ebay for nearly new for under $80 if you bargain hunt. The barometer worked flawlessly as did the gyroscopic, orientation data, GPS, and camera. 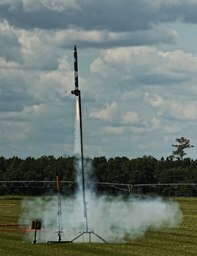 When this rocket had a cato a year ago, it obtained a spin to it due to the hard impact. Since I like filming during launches and spin makes you dizzy, I wanted to test reduction of spin by applying masking tape to the aft end on the opposing side of the fins. Reduction of spin was about 1/3. I had a total of 11 revolutions during this flight. Now that I have had confirmation of reduction, I'll now make a more permanent solution by removing the masking tape building up the aft end of each fin with primer and retesting. The Nexus 4 is known for its low battery life and heat issues. I was worried about the heat on the last launch. I should not have been - I had remembered the overheat value incorrectly and the phone stayed 20 degrees lower than the threshold to shutdown on a hot June launch day. I did keep the phone in the shade and thinking it was close to overheating (Later I added ice on top of the sealed bay in a bag-This was not necessary after review.) For all phones, I recommend assembling your rocket in the shade to reduce heat. The power hungry Nexus 4 will last 4 hours using my app. The Nexus 5 and all modern phones will last all day. The new google Nexus 5x maxes at 8Gs per axis and has a fantastic camera. In the future I look forward to obtaining this phone and running the same test to see how it compares with the awesome data I have obtained on iPhone 6. Don't get me wrong, the Nexus 4 provides the best data I have seen for an older phone, especially since it has a built in barometer. Just fixed the revolution graph for data file. Original broken Heading in the .csv file is called HeadingOriginal. You can view the new revolution graph in the .csv file at top of page. Basically the yaw column reverses direction when the pitch column is in quadrant 2 or quadrant 3. The 360 and the PI() in the math convert the units from radians to degrees. I'll modify the android code to do this change automatically. I didn't like all the over-thinking that the phone was internally doing (beyond my control) to compute heading so I attacked it again, this time at a low level. I now use gyroscopic data to compute heading. The new code syncs the gyroscope data to actual compass heading just prior to launch. PI and 360 equation convert from radians to degrees. TIMER2 and TIMER1 are the current row SECONDS - previous row SECONDS. The graph is only slightly smoother than the previous graph, at the cusp as there is no tangent line associated with gyroscopic data.